Who wants silver hair? Well, alot of people! The picture above is Christina’s client Cecelia! She has very dark hair naturally. Christina was able to lighten her hair and tone it with silver. We were wondering when the silver, gray hair trend started! Well, I looked it up and it’s in Wikipedia! It’s called the Granny Hair Trend! Also known as Granny Hair. 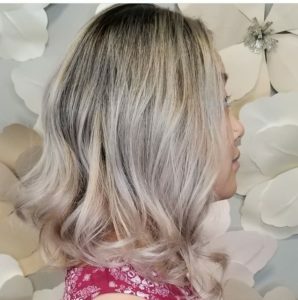 I personally have never heard this term, and it doesn’t seem like a flattering name to give the silver locks that we are doing! 25-30 years ago, there was no gray hair color that you could buy. No one EVER asked me for silver gray hair! At the sight of one gray hair, we were covering it up! Now there are so many silver choices! Women, young and old, are now adding silver or gray streaks to their hair. 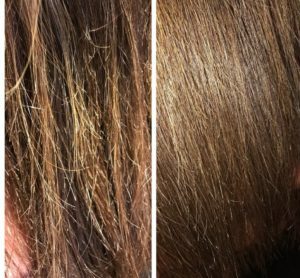 Those who are blessed with naturally gray hair are embracing their sparkly highlights! There are amazing gray shampoos and conditioners that enhance the gray and make it bright and shiny! The trend is attributed to fashion designer Jean-Paul Gaultier! In 2011 his Autumn/Winter fashion show featured models with gray beehives! 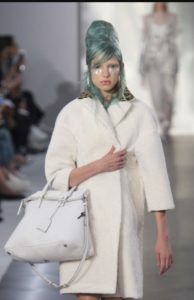 In 2015 his fashion show in Paris showcased models all with gray, silver hair. Ellie Goulding was seen in 2011 with platinum hair that was leaning toward gray. Kelly Osbourne was also wearing her hair gray in 2012. Unfortunately, this is one of the hardest color services to do. The hair must to lightened to the palest white. If the hair is even a little bit yellow or gold, the silver hair color can look green or have an odd blue cast to it. It’s so sad to explain to someone who has dark, dark brown hair that this may be something that they may never be able to have. 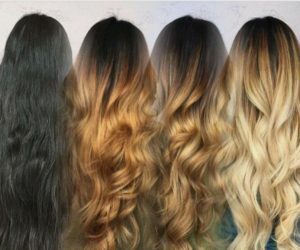 It’s especially difficult if someone has dark hair color on the ends of their hair to begin with. The hair has to be lightened with lightener and sometimes that color just doesn’t want to lighten past a pale red or gold. Hair can be only lightened so much at one time before it loses all of it’s integrity and starts to break off. It’s a long process and you need to do lots of treatments that will keep your hair healthy as the process goes along. Brazilian Blowout Split End Repair is an amazing 10-minute treatment! If your hair has had too much fun this summer and needs some tlc, this split end repair may be just what you need! 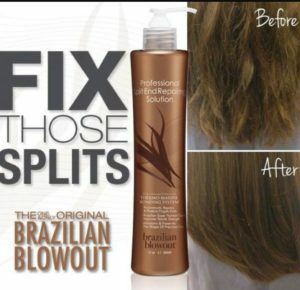 We love the Brazilian Blowout Smoothing Treatment and now they’ve developed a treatment to help your split ends! Nothing can replace a great haircut, but you don’t always want to cut as much as you need to. Also your hair can be split not just on the ends. Often split ends can go up into the hair 4-6 inches from the bottom. The treatment is applied to the bottom of the hair and can help the ends look rejuvenated! The Split End Repairing Treatment is a 10 minute service that is only performed on the ends of the hair to instantly repair, mend and seal broken and split ends for up to 4 weeks. It can be preformed on all hair types. It can be given after any chemical service or just alone after a haircut. It is important to use a sulfate free shampoo at home, so that you don’t remove the repair system from your hair. The Split End Repair has a Thermo-Marine Bonding System™. It is a heat-activated, protein-enriched technology that instantly gathers and binds together broken and split ends while the Brazilian Blowout Super Nutrient Complex™ smooths the cuticle. The end result is stronger, healthier ends defended against damage caused by heat styling, hot tools and environmental stress. It eventually shampoos off after 4 weeks or so. The less you shampoo the better and making sure you use sulfate free shampoos are imperative. After your haircut or other service the product is applied to damp hair. It is then blown dry and a low heat flat iron then seals the product onto your hair. Instantly your hair looks smoother, healthier and damage free! We are offering this service in the salon for only $15! Who doesn’t want smoother, healthier looking hair! Get rid of your Gray Hair Troubles! These gray haired beauties are perfect but not everyone is thrilled to see their first gray hair! It can be very unsettling! You wonder if this is just of the beginning of the spiral downward of more and more gray hairs everyday! Unfortunately, gray hair is just part of the process of getting older. Thankfully, there are many ways to disguise or totally do away with the those pesky, sparkling white hairs if you’re not ready to gray gracefully! Gray hair is the absence of color. The middle layer of the hair strand holds the melanin that determines what color your hair is. Over time this melanin, the pigmented cells die and will become a more transparent color, white or gray. 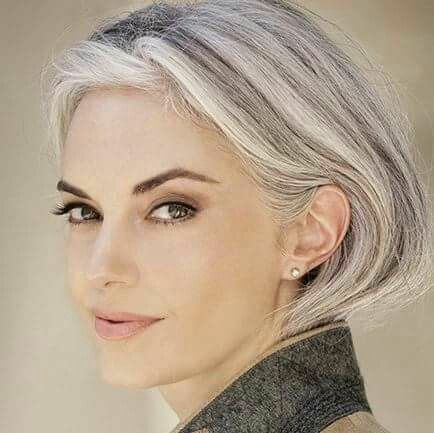 Gray hair can be beautiful and with the right style it can be gorgeous! You can turn gray at any age. It’s definitely an inherited trait. Stress, disease and nutrition can play a role in the amount of gray you see and when. 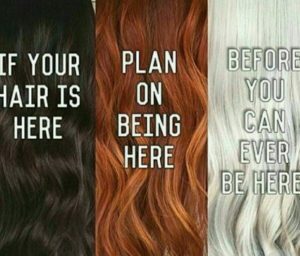 If you’re not feeling like you’re ready to embrace the grays, there are many choices for covering them up! Most gray hair can be wiry and crazy. You are very lucky if you have nice, smooth gray hair. Most of the time women like to get a body wave to bend the hair so the hair is controlled. 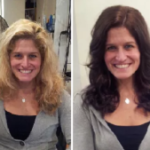 Color processes also will make your gray strands alot more agreeable and smooth. What ever you do “Don’t Pull Them Out”! It’s better to have gray hair than no hair. Try to tuck them in or use a color cover stick until you can get to the salon! There are lots of color options if you’d like to cover the gray. You can cover some of the gray with highlights, cover all the hair with permanent color or use a temporary color shampoo to blend them in. Highlights blend the gray in, not cover them totally and you won’t have a heavy line of regrowth. Semi permanent color covers the gray and gradually fades so the you don’t have to do color again or you can decide when you want to. Permanent color does cover all the gray but in a month or so you will see ½ inch of regrowth and that will need touched up. It’s best to talk with us about the options and what is best for your lifestyle. 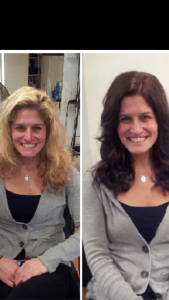 Don’t let those terrible grays get you down! New Color! It’s hard to tell which is the before and which is the after. Liz is beautiful with both! We actually went darker this time. It’s much easier to go darker than the other way around. Going lighter usually takes a few hours and most of the time it takes a few appointments of going lighter each time. Color is the best way to change your look if you’re bored. It’s a good choice if you are not quite ready for a big change in haircut. Maybe Liz will try red sometime! This is what Color Correction looks like! This is a full head of highlights done by Christina DiBello. 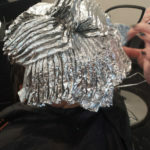 Every single hair is inside the foil. This is a client who wanted to change her hair color from dark to light. 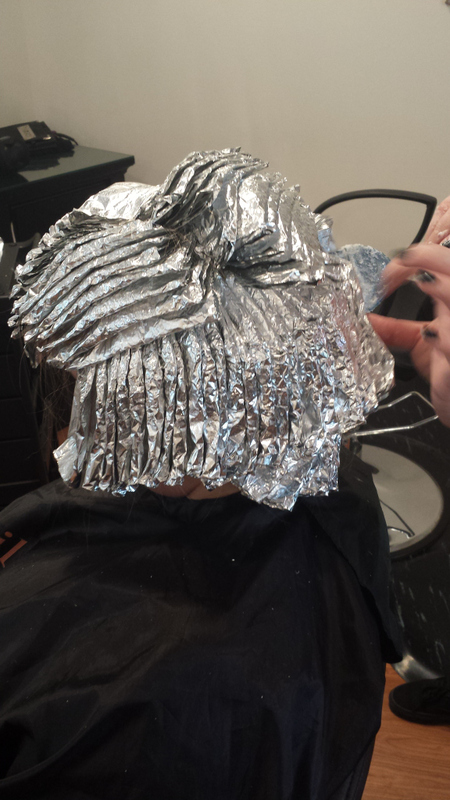 The hair must be lifted so all color is removed so that we can then put back on the color that you want. This takes lots of time and patience. I just love the way all of that foils looks.